This li'l daredevil likes to do all kinds of things that give Mommy gray hairs. One of his favourite things to do is pretend he's an acrobat and put his toy truck into crazy places and balance on it. 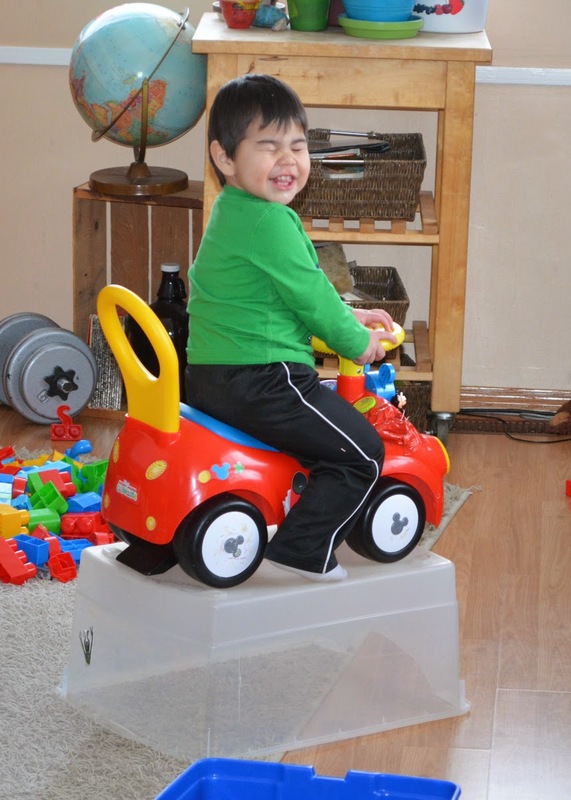 Besides the upside-down blocks container in the photo above, he has done something similar on the couch so he could see out the window while sitting on his truck. He has also stood straight up on the steering wheel and balanced there perfectly--thankfully, while the truck is firmly on the floor! He is always so proud of this feat (and it really is one to be proud of at this age), but I always calmly and firmly (so as not to startle him) tell him to get down immediately. Gonna have to get this boy into gymnastics! Levi is becoming quite the reader--he currently enjoys looking at books that have vehicles in them (of course), but we have let him graduate beyond board books to the closely-supervised perusal of other children's picture books. He also loves the books about animals that we have. Until the last few days, all four-legged largish creatures were "hoe" for "horse", but he is now starting to pick up on "nie-no" for "dino." Levi and Noah learn about cheetahs together. In another new development on the language front, all vehicles up until this week have either been "tractors" or "truckos". On Tuesday, while we were walking back and forth from the autobody shop to Tim Horton's (a route that goes by Rentco and a very busy main intersection), he actually started using the word "hoe" for hoes, and used it correctly several times that day! In less than two weeks, this little man will be two years old. He has now been part of our family for almost a year (on Sunday, the year will be complete) and has brought us so many blessings. We love our little Munchkin, and it would be tough to imagine our family without him. I love watching you grow, little Levi!